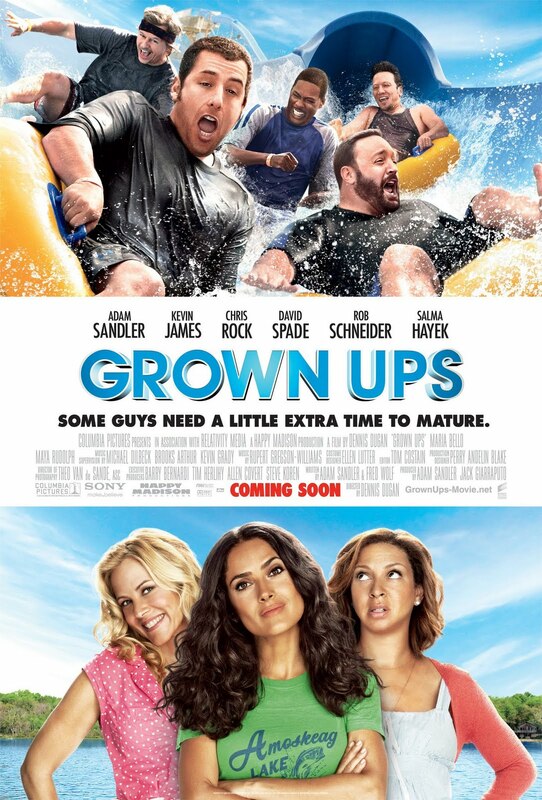 It's been almost two weeks since I watched Grown Ups in TriNoMa but I still wanted to make a review because it is so hilarious that it will makes you laugh from beginning till the end of the movie. "Play life like how you've played the game today so that when the final buzzer of your life goes off, you will have no regrets." These were the words given by Coach Buzzer after winning the 1978 Junior High Basketball Championship. Fast forward to present and the five friends already have their separate lives. Lenny (Adam Sandler) is a Hollywood agent married to Roxanne (Salma Hayek), Eric (Kevin James) is married to Sally (Maria Bello), Kurt (Chris Rock) is a house husband wherein his wife Deanne (Maya Rudolph) is the one who works, Rob (Rob Schneider) is married to Gloria who is 30 years older than him, and Marcus (David Spade) is a single who is afraid of commitment. When the news came that the Coach Buzzer passed away, it became a time for the five friends to have a reunion with their families. They rented a lake house since it's the fourth of July weekend. During their stay the five shared some of their childhood memories, with Lenny lamenting how he wants his kids to be like normal kids, Eric's disappointment with his 4 year old son that is still into breast feeding, Kurt's dilemma on how his family treats him and Rob saying that he was a disappointment to the coach for failing 2 previous marriages. They have tried showing the kids what they do during their childhood days. During that stay they started to find out things that sometimes life is not that complicated than we think. It seems that everyone has been hiding something from each other. Lenny is ashamed of bringing a nanny for their kids, and Eric lied of being owner of the lawn furniture company. Deanne is jealous of the nanny because she sees Kurt is having a good conversation with her and Rob hates Marcus because he thinks the latter is taking advantages to her 2 daughters. Upon confronting the issues, Lenny decided to tell the truth about why he wanted to stay in the lake house instead of going to Roxanne's fashion show in Milan. He wanted his family to experience normal life just like their friends do, because he sees that the kids is becoming spoiled. Kurt admits he had a good time talking with the nanny because he never had that talk with Deanne so she promised to take him to dates. Marcus denied sleeping with Rob's daughters because he won't do that to his friend. In the end Gloria said that even there is some hostility towards each other, love still prevails with each other. The movie ends with a basketball challenge from their childhood nemesis whom they beat in the game 30 years ago. Everybody agreed that if the coach was there, he will want to see them to play the challenge. The game ended with Lenny letting the opponent win to give them the sense of winning. My personal rate for this film is 9 out of 10. What's good with Adam Sandler's movies is that they always make you laugh at every scene but it never fails to instill family values within it. It may have overused comedy acts, but being able to show how important to show your kids how life is so simple in the past and how to be truthful to your friends and family, justifies the act.